The image that football sceptics and opponents formed in Germany at the end of the 19th century mixed the medical concern – that the human body could not cope with such a long and enduring effort – with the national ideology of gymnasts, and mixed statistics on injuries in football, rugby and American football. In 1893, the Westminster Gazette in threatening words titled the soccer game „71 blooming youngsters have been killed“. Football puts too much strain on the heart and lungs. And if that doesn’t lead to death, then it’s the violent way of playing that regularly bursts bones. And in addition this unnatural, forward bent posture, which is not at all German. – So the opponents of the football play like also other kinds of sports. The supporters of the sports, English men in Germany at the end of the 19th century and enthusiastic German, refuted the accusations. Again and again the sports newspapers and the DFB’s football yearbooks before the First World War was justifying why football was not as violent as described, but even had advantages. By the way, there were neither 1912 nor 1893 deaths in the Berlin association „Deutscher Fussball- und Cricketbund“. The latter states for 1893 that deaths were mostly children who tried to fetch footballs hanging in tubes and on roofs and had an accident in this try.1)Cf. Grampp, M.: Ist das Fussballspiel gefaehrlich? In: Spiel und Sport 3 (1893), 03.06.1893. p. 9-10. There were also no injuries in these two years that made the players unable to work in the long run. Nevertheless, there were deaths and suffered incapacity for work actually in football, albeit extremely rarely. In the following I will compare Karl Planck, professor and gymnastics teacher at the Eberhard-Ludwigs-Gymnasium Stuttgart, with his polemic writing „Fussluemmelei“, foot-sloutching (online), and the statistics on injuries at matches of DFB members in 1912. Planck refers exclusively to association football, not to rugby, American football or any other form of football play. In square brackets are the page numbers. Runge, Johannes: Ergänzungssport (English: Supplementary sports). In: Deutsches Fussball-Jahrbuch 10 (1913). p. 288-309. Planck: „[p. 6] First of all, that move is already ugly when viewed in terms of its mere form. The sinking of the standing leg into the knee, the curvature of the carved hump, the animal stretching of the chin [p. 7] degrades man to a monkey, even if the posture does not reach the degree of repulsive ugliness, […]. Another spot with the little finger of the left, and the splendid structure collapse to the ground or in miserable jumps, in order to keep on its feet.“. 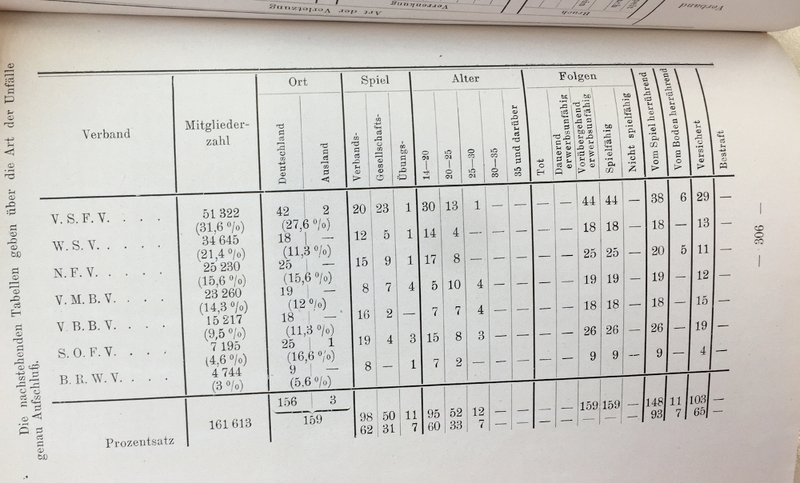 DFB statistics 1912: Especially heart and lungs are benefitted by the required endurance and speed, and arteries dilated. But the association game does not lead to spinal column bends and, besides, is playable in the open air and also with bad weather. In addition, there is the large number of participants and the even exercise of muscles and body flexibility. The posture of the running is of course different from that of the standing gymnast. Planck: „[p. 18] The deaths caused by the game in England alone, at least ‚by kicks to the abdomen, the pit of the stomach, against the spine or against the head‘, count alone after hundreds, if not after thousands, quite apart from the other injuries of temporary and permanent [p. 19] kind. According to the ‚Brit. Med. Journ.‘ the probability of an accident in football is 18 times greater than when riding and 20 times greater than when doing ‚gymnastics‘.“. 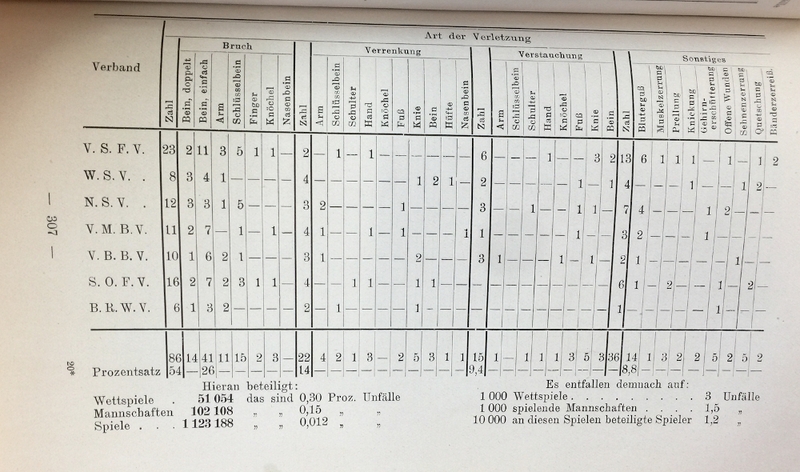 (My comment: For lack of such statistics, I cannot verify the comparison to injury statistics for riding or gymnastics for the early 20th century, but I can with the statistics of injuries at the Turnfest in Breslau (Wroclaw Gymnastics Festival) from 21 to 25 July 18942)Cf: NN: The spit turned around! In: Game and Sport 4 (1894), 25.08.1894. p. 1-2.: 752 injuries were recorded – that makes 6.54% injuries per gymnast with 11500 participants. And in the Turnerbund there were 1.2% injuries per gymnast in the whole year 1912, mention the Yearbook of the DFB. DFB statistics 1912: In football, on the other hand, only 0.098% of injuries per DFB member occurred in 51,054 matches. In other words: 0.31% accidents per match, i.e. one injury in every three hundredth match. Two thirds of the injuries occurred during association matches. The statistics vary from association to association. Most injuries occurred in the SOFV (1.2% per match, i.e. 0.6% per team), the fewest in the VMBV (0.14 per match, i.e. 0.07% per team). Runge, Johannes: Ergaenzungssport. In: Deutsches Fussball-Jahrbuch 10 (1913). p. 288-309, here p. 306. SOFV: Southeast German Football Association (= Silesia, Lausitz, Breslau) * VMBV: Association of Central German Ball Clubs (= Saxony, Saxony-Anhalt, Thuringia, Upper Franconia, Eichsfeld) * VSFV: Association of South German Football Clubs (= Southwest Germany with Rhine-Main to Hanau, Darmstadt, Aschaffenburg) * WSV: West German Game-Association (= today’s North Rhine-Westphalia, Greater Osnabrueck, Goettingen, North and Central Hesse, Koblenz) * NFV: North German Football Association (= Hamburg, Bremen, Hannover/Braunschweig/Hildesheim, Northern Lower Saxony, Schleswig-Holstein, Mecklenburg) * VBBV: Association of Berlin’s ball game clubs (= Berlin) * BRWV: Baltic Turf and Winter Sports Association (= East Prussia, West Prussia, Gdansk, Memel, Pomerania). Planck: „[p. 17] The foot armed with heavy shoes – in patent leather shoes you don’t play football, as little as barefoot – is not a harmless weapon. […] But the opponent is already so close that he – nobody can know for sure – possibly gets the kick that was intended for the ball. The reckless now holds back, because the possible profit from a possible misfortune seems too high to him, and the game loses its attraction for him. But the ruthless one comes up against it and thus has a double advantage: first by the restraint of the other, who lets a possible success fade away, because the stake seems too high to him, and then by his own ruthlessness, which results in success, be it at the risk of fatally or seriously injuring the other.“. DFB statistics 1912: 54% of all injuries during the 51,054 games were bone fractures, mostly simple bone fractures. Less frequent were bruises, open wounds, concussions. Today’s frequent injuries such as turning one’s ankle, tendon injuries, ligament tears and muscle strains, on the other hand, occurred only seven times. Turnfest 1894: In gymnastics it was the skin that was affected. One third of the gymnasts suffered wounds (especially blows and stab wounds) and internal wounds and a good third of the gymnasts suffered skin abrasions and skin inflammations. Bone fractures, dislocations, sprains, bruises and strains, on the other hand, accounted for only 8.8% of injuries suffered by gymnasts at the Turnfest in Breslau (Wroclaw Gymnastics Festival) – compared with 79.2% at the 1912 DFB Games. Runge, Johannes: Ergänzungssport. In: German Football Yearbook 10 (1913). p. 288-309, here p. 307. SOFV: Southeast German Football Association (= Silesia, Lausitz, Breslau) * VMBV: Association of Central German Ball Clubs (= Saxony, Saxony-Anhalt, Thuringia, Upper Franconia, Eichsfeld) * VSFV: Association of South German Football Clubs (= Southwest Germany with Rhine-Main to Hanau, Darmstadt, Aschaffenburg) * WSV: West German Game-Association (= today’s North Rhine-Westphalia, Greater Osnabrueck, Goettingen, North and Central Hesse, Koblenz) * NFV: North German Football Association (= Hamburg, Bremen, Hannover/Braunschweig/Hildesheim, Northern Lower Saxony, Schleswig-Holstein, Mecklenburg) * VBBV: Association of Berlin’s ball game clubs (= Berlin) * BRWV: Baltic Turf and Winter Sports Association (= East Prussia, West Prussia, Gdansk, Memel, Pomerania). But between gymnasts and football players there were not differences and disputes everywhere. In 1893, Berlin’s newspaper Spiel und Sport reported that more and more gymnastics clubs also had football teams and that the mixture of gymnastics and football games gave a new and successful mixture.3)NN: Football matches of our academic gymnastics clubs. In: Game and Sport 3 (1893), 18.03.1893, p. 4. Cite this article as: Petra Tabarelli: About injuries in football around 1900 in Germany. In: Nachspielzeiten, 31. Januar 2018. URL: https://nachspielzeiten.de/about-injuries-in-football-around-1900-in-germany/ (zuletzt aufgerufen: 20. April 2019). 1. ↑ Cf. Grampp, M.: Ist das Fussballspiel gefaehrlich? In: Spiel und Sport 3 (1893), 03.06.1893. p. 9-10. 2. ↑ Cf: NN: The spit turned around! In: Game and Sport 4 (1894), 25.08.1894. p. 1-2. 3. ↑ NN: Football matches of our academic gymnastics clubs. In: Game and Sport 3 (1893), 18.03.1893, p. 4.